Some things get better when they’ve been around a while. Ryan Gosling for example, or Niagara wine, or hey—even already-pretty-good-looking General Managers. And then there’s the Chevy Equinox. Now we’re not suggesting an older Equinox is better than the all-new 2018 model. We’re saying only this—the old ones are good, but the new ones are even better. But don’t take our word for it, look at the evidence. Excellent cars? They win “Wards 10 Best” awards. “Wards” refers to Wards Automotive magazine—and while that may not be a household name, Wards is a big deal in the auto industry. Any time they judge a vehicle one of the “10 Best” you can be sure it’s mighty impressive. And the 2018 Chevy Equinox? Recently judged to have one of the 10 Best Interiors. That means it’s on a par with cars costing two, three, and even four times as much. High praise indeed—and if you’ve checked out an Equinox you’ll agree it’s deserved. But if you haven’t been to look at an Equinox yet, here’s what else you’re missing. It’s comfortable and quiet, has some giddy-up when you need it, and sips gas when you don’t. No wonder it’s been a best seller for several years now. 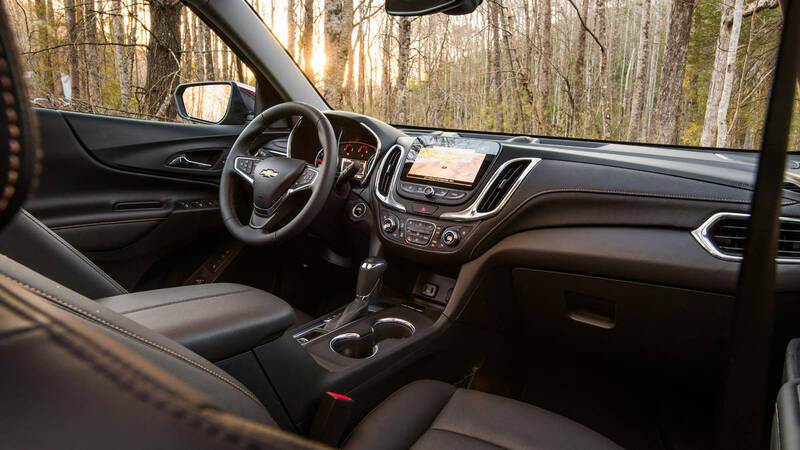 For 2018 the Equinox was restyled and re-engineered. It’s become a little shorter, lower, and—most important—lighter. That’s especially significant because, as engineers love to explain, that means less momentum… and therefore greater agility through the twisty bits of road. Outside it sports what seems to have become the Chevy “look.” The bowtie emblem adorns the hood and LED daylight running lights are standard. The flanks appear wind-sculpted, and indeed you could say they were as prototypes spent more than a few hours in the wind tunnel. Under the hood, you’ll find one of three new engines. Replacing the 2.4-litre of previous generations is a 1.5-litre turbo. Yes, that might sound small, but power and torque are comparable to the older lump. Plus, as we noted earlier, the Equinox has been on a diet—so there’s less weight to lug around. Take it out for a test drive and you’ll find this new motor remarkably refined, and—thanks to the turbocharger—plenty powerful. If you really want more ponies there is an alternative. Chevy also offers an optional 2.0-litre engine. If you drive it, press gently on the gas because it does go! And if fuel-saving is your priority there’s also a 1.6-litre turbo-diesel. If that appeals, ask us about real-world fuel efficiency numbers. Here’s a quick run-through. The Equinox comes in LS, LT and Premier trims. 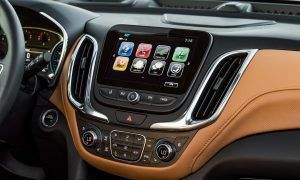 Goodies like heated front seats are standard across the range as are Bluetooth connectivity, keyless start, and the Chevrolet MyLink audio system. We’re out of space here and can’t go into all the other features on the 2018 Equinox. Why not just come see us and take a look for yourself? Call or email and we’ll arrange a time for you to get acquainted with this award-winning SUV. Maybe you’ll even meet the (imaginary) award-winning me.